Dennis Greene hopes his Boston Town walking wounded will be able to bolster his squad for tonight’s derby clash against Pinchbeck United. Striker Cameron Johnson and defender Loz Lambley both picked up niggles during Saturday’s defeat to Oadby. 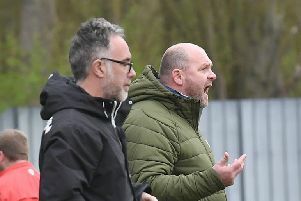 But with a number of players unavailable for tonight’s United Counties League Premier Division contest, Greene is hoping both may be able to feature. “We’re short on numbers,” Greene said. “We’ve got a few lads away and a couple with knocks, which isn’t ideal. Kick off at the DWB Stadium will be at 7.45pm.